Bread has always been here, in every culture, in every period. We enjoy it in different varieties, from raisin cakes to baguettes. But, people who have to go grain and gluten free have to avoid it, even if some meals simply call for bread. Luckily, there are reasonable and delicious varieties that these people can consume, such as sourdough bread. 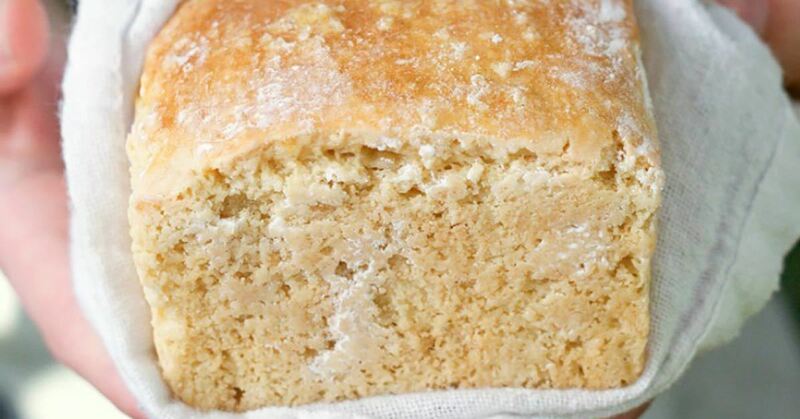 In this article, you’ll find a recipe of a delicious, slightly tangy bread with all the substance and body of a traditional quick-bread. It’ll remind you of those old world artisan sourdoughs with a density that makes them great for toasting, dipping, and grilling. This Cashew sourdough bread requires simple ingredients without any added starches or fat. And, it’s easier to prepare it than it actually seems, but the finishing product is well worth the effort. Culturing of this dough /bread makes it lower in sugar than other cashew breads, as well as easy on digestion. Only the weights of the cashews and water are listed because measuring pieces or whole cashews by the cup is quite unreliable as they fill up space differently than flour. As a result, you might get too little or too much cashew to water ratio. Cover the bowl and place it in the oven with the light on. Let it stay for 12 to 24 hours, or overnight and bake it in the morning. The heat from the oven light should be enough to successfully culture. The temperature should be from 105 to 110 degrees, and when the mixture is done, it should taste good and sour. Bear in mind that if the environment is not hot enough, it might not culture at all. If it’s too hot, it might kill the living bacteria and bake the mixture and not culture it. Other methods for culturing the cashews include food dehydrator, insulted container, yogurt maker, and water bath. If you use a standard size loaf pan double the recipe. Otherwise, you’ll need a 7.5 x 3.5-inch medium loaf pan. Add the filtered water and cashews in a food processor and blend until very smooth. The mixture is quite thick, so you’ll need to stop and stir occasionally to keep it moving. This could take up to ten minutes, although it depends on the food processor you are using. It shouldn’t be too grainy. Pour the mixture to a ceramic or glass bowl (or another non-reactive bowl) and stir in the probiotic powder until well combined. Don’t worry if the mixture is too thick – it’s supposed to be like that. Just make sure the probiotics are well combined. Use a plate to cover the bowl to prevent the mixture from drying out. Put it in the middle of the oven and turn on the oven light. The cashew mixture requires a warm environment between 105 and 110 degrees, but not warmer. Leave it for at least 12 hours, or up to 20 hours. Have in mind that the longer the mixture sits, the sour it becomes. Once the culture is ready (after 12-20 hours), preheat the oven to 300 or 325F. Grease the pan and line it with parchment paper so that it flaps over the long sides of the loaf pan. Put the cashew mixture in a large bowl and use a rubber spatula to transfer as much of it possible. Put the egg whites in a separate bowl. Beat in a tablespoon of water and the yolks to the cashew mixture until smooth. Make sure there are no lumps. Add the baking soda and salt to the mixture and stir. Then, beat the egg whites with clean beaters until soft peaks form. Just don’t overbeat them into a firm peak. Gently fold the beaten whites into the batter until they are no longer visible. Put the batter to the prepared loaf pan, gently smoothing the top. To get a round loaf, the batter needs to fill the pan about ¾ full. Whisk together the yolks and water until smooth to prepare egg wash that you’ll use to for the surface of the batter. Gently brush it using a pastry brush to get a nice crusty finish and brown color to the loaf. Bake at 325F, or 300F for convection ovens, for 45 to 50 minutes. Then, bake for another 5-10 minutes at 375F to get a golden and crusty top. It’s ok if the loaf cracks on the top or side. Remove from the oven and let it cool for ten minutes. It’s best to cut and consume the next day, but if you can’t resist you can slice it and serve once cooled.